First introduced to Mac gamers in the fall of 2007, EVE Online is a massive multiplayer online (MMO) game created by Icelandic developer CCP Games. Famous for being inhospitable to new players, EVE Online evolved in 2009 with the release of Apocrypha, a free expansion that seeks to right past wrongs by creating a new player experience and expanding the scope of the game dramatically. Apocrypha definitely pushes EVE in the right direction, but this isn’t a complete metamorphosis of the EVE experience. If you’ve tried EVE and don’t like it, chances are Apocrypha won’t change your mind. If you’re new to EVE, however, now’s a great time to get started. The story of EVE takes place eons in the future. Mankind has populated thousands of star systems in a distant galaxy and has aligned into four factions: the religious Amarr, the egalitarian Gallente, the corporatistic Caldari and the rogue Minmatar. (A fifth “race,” the Jovians, are enigmatic, mysterious and keep to themselves; part of the game’s mythology, they are not a playable race.) All of them are engaged in a cold war of sorts; a détente in which each of them occupies their own space and occasionally clash with one another or establish trade and diplomatic relations. And, as you can guess if you’ve ever played other online games, each of them has strengths and weaknesses, and CCP constantly works and reworks balancing between the four to make sure no player has an overwhelming advantage in PvP combat. Unlike World of Warcraft or other similar fare, your interaction in EVE doesn’t take place face-to-face. Instead, you’re a Capsuleer, an elite pilot who commands a massive starship. All of your interactions in space in and stations takes place in your ship (a forthcoming expansion will let you leave). EVE is one of the purest “sandbox” style games you will ever come across. It’s truly up to you as to what you want to do, whether it’s become a pirate, hanging around warp gates, looting travelers; a merchant, trading raw materials or transporting goods and cargo; an industrialist, using factories and research facilities to manufacture products you can sell on the open market or make for other player for commissions; or the head of a battle group, commanding a battleship, carrier or other massive weapons platform in the giant Player versus Player (PvP) battles EVE has become famous for. All this adds up to a learning curve that has been likened to a cliff; the game has a tough user interface to master, and relies upon a real-time experience building system that lets you improve your character’s abilities even if you’re not playing. Unlike World of Warcraft, for example, there’s no concept of level-grinding; if a skill you’re learning takes a week to master, it takes a week in “real-time,” even if you’re not playing. Apocrypha makes it a bit easier for new players to get into the game. New players get a bonus to their learning ability to make it easier to get started with the skills they need to pilot bigger and better spaceships. 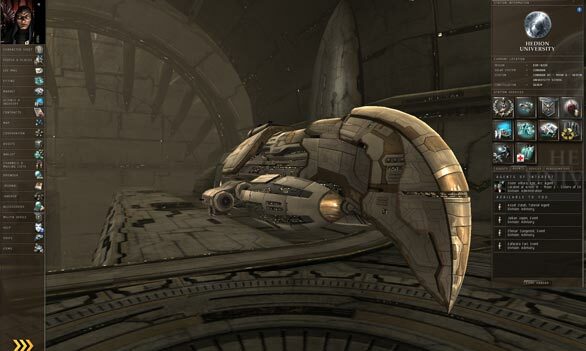 Players who buy the Apocrypha retail package (distributed by Atari and sold anywhere you can get PC games) get a couple of bonuses; a special ship and a standings boost that lets players experience EVE Online style warfare right away, without having to slowly improve standings by playing missions that increase their reputations with different factions within the game. The new player experience also introduces an “epic mission” arc, a series of dozens of interconnected missions given to you by non-player character “agents” within the game. If you follow the epic mission arc to its conclusion, you’ll be well set-up to play the game for a long time, because you’ll have quite a bit of in-game money to use and you’ll have amassed an impressive amount of equipment and standing with various elements within the game. Unfortunately, much of the epic arc involves combat missions. I hope that CCP will expand the types of epic arcs in the future to include other types of play, for new gamers more interested in becoming industrial titans, researchers and so on. Social gaming is a key part of the EVE Online experience. While it’s possible to play solo in EVE, it is, frankly, boring. Players are strongly advised to join a player-run corporation (the EVE equivalent of a guild) as soon as possible. Unfortunately, Apocrypha really doesn’t do anything to streamline that process or familiarize new users with it. I hope this is something that CCP can work towards in the future. Tech III vessels are also part of the Apocrypha expansion. This improvement is designed to appeal to the most experienced EVE players who are already commanding Tech II vessels and are reaching the limits of what they can do: These new vessels are modular, and can be configured with a wide array of capabilities, permitting players for the first time to totally customize the role of their vessels. Wormholes are also a new embellishment, again for more experienced players, areas of space that shimmer in and out of existence which can be followed in search of wealth and new technology. Often these areas are protected by hostile non-player characters (controlled by the computer) that will shoot first and not bother to ask questions at all. The Mac version of EVE gets some improvements in Apocrypha, most notably by the introduction of Premium graphics-more than a year later than CCP and Mac development partner TransGaming’s first estimate, but welcome nonetheless. They make an already fantastic looking game look even more realistic by incorporating more levels of detail and more sophisticated special effects than were available before. This taps into 3D rendering technology that may put Apocrypha beyond the limit of some Macs below the officially supported system requirements. But newer MacBooks and Mac minis that use Nvidia GeForce 9400 integrated graphics should be in good shape. Apocrypha (and its updates) have certainly improved the Mac play experience, sometimes dramatically, as in the case of Premium graphics; sometimes incrementally, as a few maintenance updates since then have done to improve overall stability. I’ve been playing EVE since it debuted on the Mac, and I can say without hesitation that it’s better now that at any time since its initial release. But I’d be remiss to ignore the experience of EVE veterans who are also Mac users. They’ve lamented the Mac version’s performance compared to its Windows counterpart. EVE on the Mac runs slower than EVE on Windows, even on the same Boot Camp-equipped Mac. There can be pronounced differences in performance and stability when running EVE at high resolutions, or in big PvP battles, where there are a lot of people on-screen all doing things at once. There are a variety of factors at work here: EVE Online uses TransGaming’s Cider to work on the Mac, a technology that leverages the Intel chips found on Macs built in the last three years to let Windows games run on the Mac. And even TransGaming admits that Cider sometimes incurs a performance penalty compared with a game running natively in Windows. Apple’s OpenGL drivers aren’t perfectly parallel to Windows DirectX, either in performance or in capability. And Mac users make up a relatively small percentage of EVE Online’s player base, albeit one that CCP has been eager to please. Whatever the case, Mac users remain acutely aware that EVE Online on the Mac is still an inferior experience to EVE Online on Windows. At least until you exit the game and go back to the operating system. Casual gamers or people just looking to blast some aliens ought to keep looking: EVE Online isn’t for you. But if you’re willing to invest the time and effort to really get the most out of this incredibly deep and intricate game, you’ll be hard pressed to find a more rewarding game experience.